I know, from personal experience and my work every day, that if you are going through a divorce or thinking about stepping into that place, this is a very sensitive and emotional time for you. I intend to bring you information each week that will be of great value and inspiration and will help you through this time as “gracefully” as possible. And since I haven’t been in touch in awhile, I thought I would start out by explaining my concept of a “graceful” divorce. I mean, really, most people hear the word “graceful” and “divorce” and wonder how those two words can be used in the same sentence (the same universe one person commented! ), much less next to each other. Here’s what I want you to know. Divorce is never an easy thing to go through, but it can be done better than it’s been done in the past when you approach it from a mature, thoughtful, and intentional place. And that, in itself, is not easy to do when you are in the throes of ending a significant relationship, but it can be done and it is being done every day. For most of us, this means being informed about our options, taking the time to get clear on how we want to go through the process, and taking our time to formulate ideas about how we want our life to look in a year or five years down the road. This is how a graceful divorce can be accomplished. Decide what you want your life to look like a year from now and then five years from now. Become informed about your process choices (mediation, collaboration, negotiation, litigation) and how they work, and decide which one is best for your situation and circumstances. Basically, which process will be best to help you achieve your vision of your life a year from now and five years from now? Choose the most skilled professionals who can advise and support you through the process you choose and who can help you achieve your overall goals. That’s the way to do it. And, again, I’m not saying it’s easy, but I am saying it can be done (it is possible! ), and it is worth it, especially if you have children. 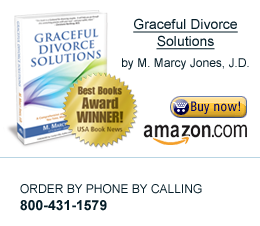 But whether you have children or not, going through these three steps thoughtfully and intentionally …… this is how you can achieve a more “graceful” divorce. And if you want more specific and detailed information about how to do this, be sure to check out my book, Graceful Divorce Solutions: A Comprehensive and Proactive Guide to Saving You Time, Money, and Your Sanity, available at Amazon. com.